As Tropical Storm Harvey bears down on the Texas Gulf Coast, the Federal Emergency Management Agency is sending supplies from its warehouse in Fort Worth to a staging point at Randolph Air Force Base near San Antonio. The supplies, which would be used to help people affected by the storm, include about 250,000 meals, 77,000 liters of water and 4,000 tarps. 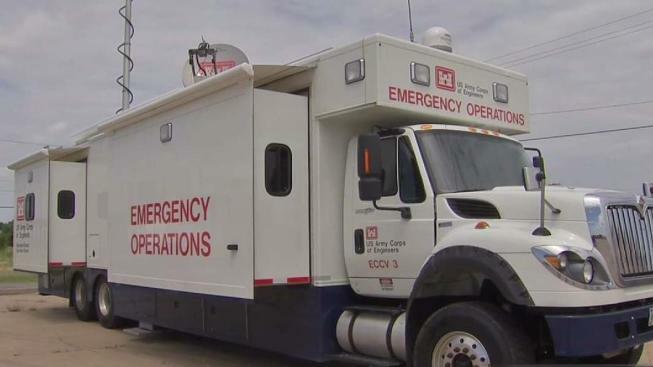 Only last week, FEMA and the U.S. Army Corps of Engineers held a joint training exercise at the Fort Worth Federal Center to help prepare for hurricane season. "This is an opportunity to exercise and validate the team, to ensure they're prepared to respond to a mission," said Army Corps spokeswoman Nancy Church. Using generators provided by FEMA, the Army Corps is responsible for helping to restore power to critical facilities, including hospitals and fire stations. "It is critical that we get the life, health and safety aspects back up and powered," says Army Corps Maj. French Pope. "Getting power to those hospitals, to the fire stations, waste-water treatment facilities as well as power generation facilities, those are all critical to sustaining life in the area." "These exercises, we're going to put our teams through a lot of different scenarios so that they are absolutely ready for the worst-case scenario," Pope added. "So in the event that there is a disaster, they can respond and do it in a very efficient manner."